I recently had a flashback moment with this wonderful green cold crunchy lentil salad. 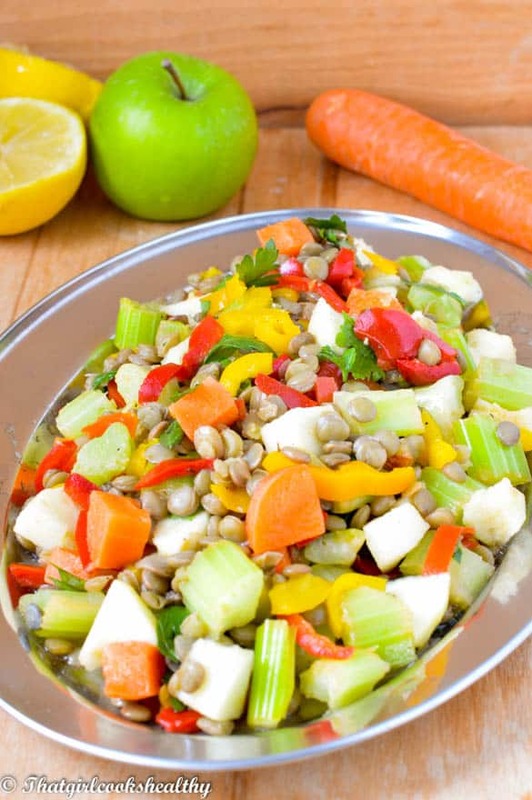 I became acquainted with this green lentil sald recipe through a person that I subscribed to on YouTube, she had a host of cooking videos on her favourite list and one of them happened to be when Padma Lakshmi featured on the Ellen show. As I watched I relished the idea of incorporating vegetables with apples, infact that was my only reason for trying the recipe. My curious nature wouldn’t allow me to by pass this golden opportunity. After all it looked fun, simple appetising and not to mention the green lentils were calling out my name so why wouldn’t I prep this salad? It was everything I could have ever dreamed for at that moment in time. Needless to say the meal was a hit, to the point where I repeatedly made this dish for a whole week. Actually that’s a half truth it was convenient for my student life, so making a big batch was handy to eat around a busy school life. The taste is wonderful, a hint of citrus from the lemon, sweet crunchiness from the coconut topping and apple. This is definitely the type of vegan lunch with a difference that you want in your life. An array of healthy carbohydrates from the assortment of vegetables. The lentils lend a generous boost of protein power. I would sum this up as the perfect green lentil vegan salad and definitely something to consider as a recovery dish after an arduous workout session. I’m conflicted in terms of where to categorise this meal. It’s suitable for both lunch and dinner hence the title of my post. Don’t forget to place the apple in some water with himalayan pink salt to decrease the chance of the fruit becoming too dark. I recommend serving immediately or as cold dish (do not reheat). Store the leftovers in the refrigerator. 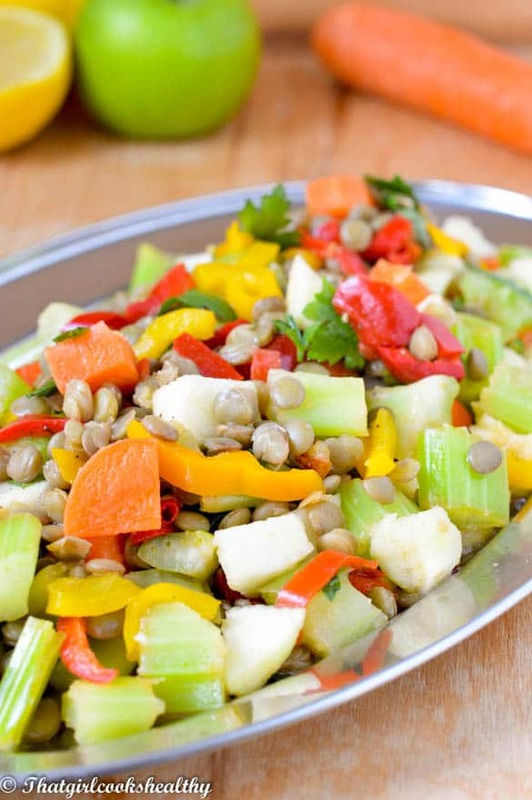 If you love this green cold lentil salad you will love………. Start off by washing the lentils and simmering on low heat in the 4 cups of water for roughly 25 minutes. The lentils should be tender not mushy, you can determine the tenderness by pressing gently with a fork.Once cooked remove from heat drain and discard the water and set to one side. 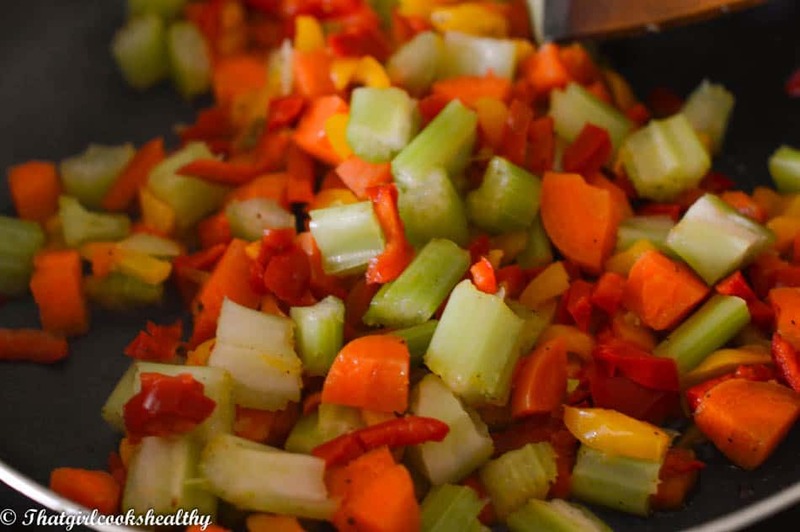 Preheat the olive oil in a frying pan on low heat, then add the bell peppers, carrots, celery, black pepper and salt. Sautee for 5-7 minutes, flipping and tossing the vegetables to ensure the oil has coated each piece. Set to one side to cool down. Once both vegetables and lentils have cooled completely transfer into a large bowl. Add the parsley/coriander mix, lemon and apple into the bowl and work in the condiments using both hands. In a frying hand preheat the sesame oil on medium heat. When hot gently stir in the ginger, coconut and black mustard until toasted. The mustard seeds may begin the crackle. Sprinkle the coconut garnish over the lentils and serve. If not eating immediately make sure to submerge the apples in saline water to lessen darkening. If using canned lentils, you can skip the simmering stage and move onto the second step. This looks lovely. I have been eating a lot of lentils recently, as they are really cheap and a great healthy source of protein. Me too Dannii. Lentils are one of my favourite sources of protein. I buy them in bulk from the supermarket, very cheap and cheerful. Thanks, do try and let me know if you like it. Hello, Charla. This looks delicious! 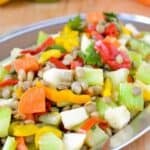 I have been looking for more ways to get more fruits and vegetables into my diet, and I love lentils. I will definitely try this. Thanks for the recipe and for the beautiful photos. It’s a brilliant balance of veggies with fruit, something a person with an open mind would enjoy.